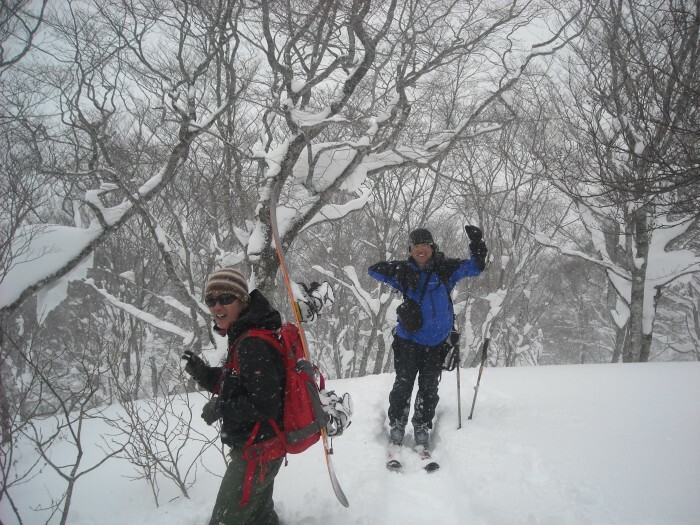 As alluded to here, my last weekend was my final backcountry expedition for the wonderful wintry Japan season of 2011-2012. 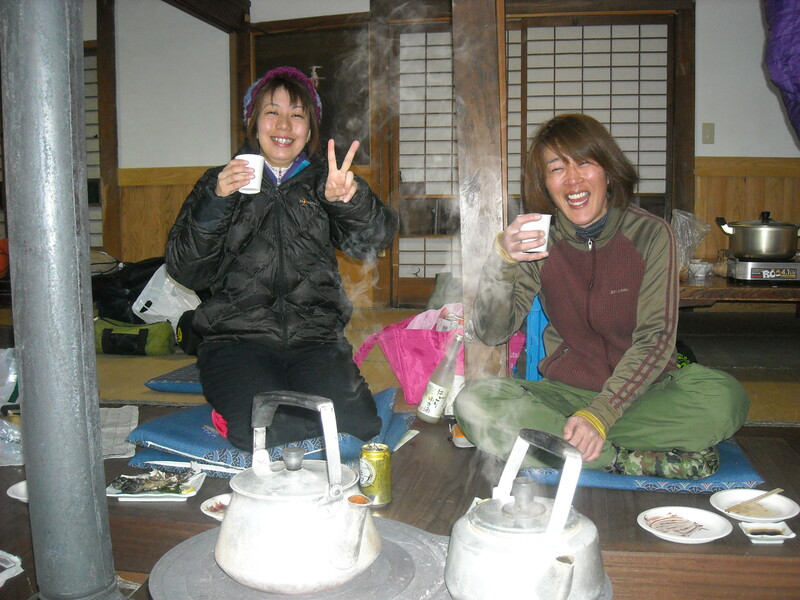 The trip took us (where "us" is defined as myself, Kanji, and Kazumi, along with the organizers of the trip, Jun and Satoko) to 栗駒, "kuri-koma", up on the border of Iwate prefecture and Miyagi prefecture. I was in a state of ick all morning (詰まり調子悪かった) and hardly remember any of the drive out, which is a good indication that I was sleeping. The wind at the parking lot was absolutely incredible, and made the temperature seem much lower than it actually was. I knew the name of that game, but figured the wind would be with us the majority of the way up. Coming over yet another ridge the wind came back with a vengeance. Visibility plummeted, and I was regretting putting my mask into my pack in an instant. I pulled my hood down as tight as it would go and just decided to push my way through the storm til we hit safety. The blowing snow covered my liners and my sunglasses became mysteriously frozen over. My head hunched down into my jacket as much as possible, I kept my field of vision open just enough to see Kanji's snowshoes and otherwise worked hard to block myself off from the environment. Thanks to what I did with my yellow jacket, you could summarily say I was "turtling" along in my green one. Hur hur. 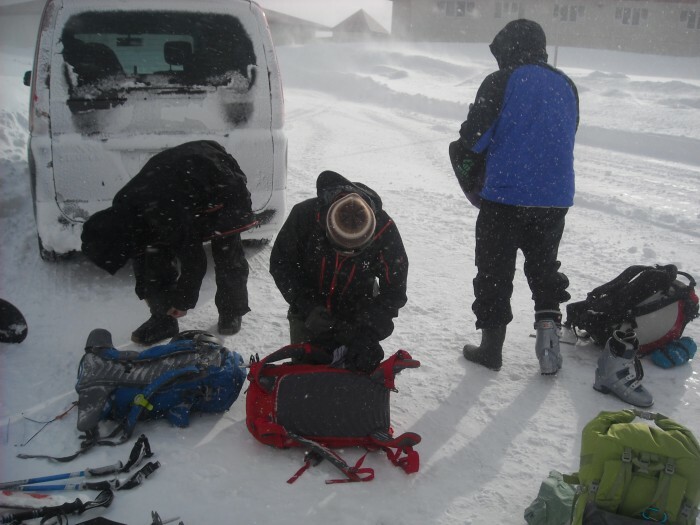 We came upon a structure buried in the snow, broke out shovels, and dug out a door. Compared to the howling wind outside, the silence in the emergency hut was, well, silent. Very. Taking advantage of the respite we ate lunch. My snow covered liners soon became soaked, so I used the opportunity to try an idea I've had for awhile. I put on my main gloves, and then shoved those inside of my mercury mits. Great success. Meanwhile, the mystery of the frozen sunglasses should be explained, but not too clearly. Essentially, the wind and cold worked together to convince my nostrils to begin excreting a substance which the wind then lifted onto my glasses. Mmm! With a bit more traversing we came to the spot where we would take off our skins. (That sentence probably sounds odd to people who don't know backcountry. 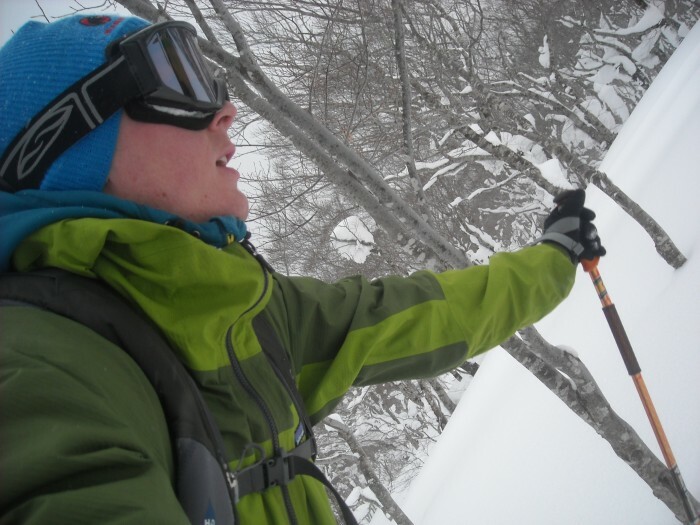 Skins are the things underneath our skis that keep us from sliding backwards as we climb the mountain.) The ride down started slow, working through lots of powder on a pretty flat slope. Being the lazy man I am, I let Kanji and Kazumi get ahead of me in the hopes that things would be easier following their "trace". Some things I failed to think about (there was a lot of thinking failure during this part of the morning) were: a) Kanji and Kazumi are both regular, I am goofy and b) Kanji and Kazumi are both much shorter than I am. Roll those two facts together and you come up with a startling realization. Branches that lightly touch upon the top-back of their helmets will instead whack me directly in the face. In some ways, this was something I was prepared for. One of the main reasons I wear a helmet is its gift to allow me to ignore tree branches in favor of pretty lines. I saw a particularly thick branch coming, but didn't worry much, as I could feel something covering my face and was instantly assured it was my helmet. That line of thinking, however, makes absolutely no sense. The thing covering my face was just a plain old snow mask made from fabric, completely unrelated to anything at all protective like a helmet. Helmets cover heads, not faces. Awhile later, I met up with everyone at the bottom of the run, blew out my nose and the snow turned red. Good thing my nose was already broken! Today, five days later, is the first day I can say it doesn't feel tender anymore. Kazumi and Jun agreed with my general outlook on things. Anyways, after that quick change of uniforms, we were back to hiking! Even the muscle-legend that is Kanji couldn't keep up with all my stoke! But to be fair, I think it's a lot easier to skin up this mountain than to try to snowshoe it. This second run was outright terrific. 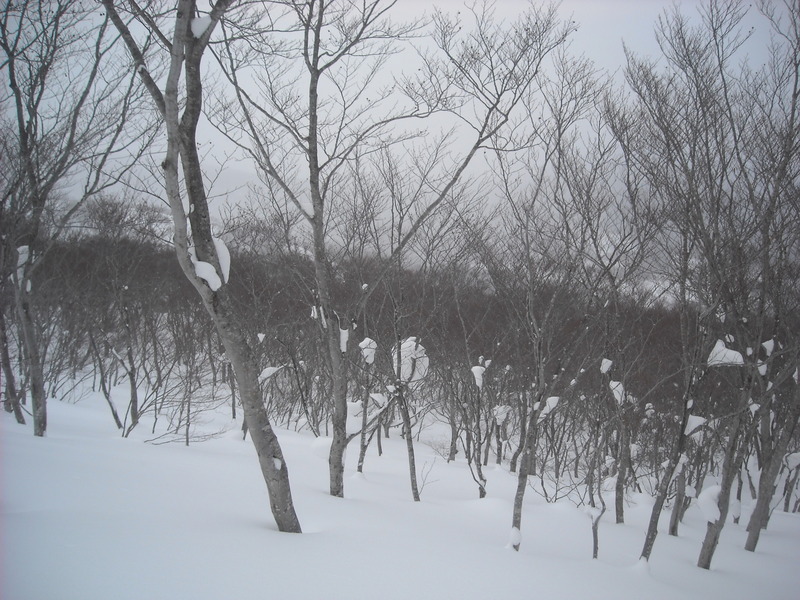 We were being careful to stay in trees because of all the snow that had been coming down over the last day or two, but at the end I managed to cut a pretty little surface ave that was really nothing bigger than the slough you'd expect to roll on a steeper slope. When the slopes are as pretty as this, it can't be anything but fun. Our last was over a big, wide, open, steep hill. In other words, ohhhh boy. I took this baby straight, built up lots of speed, saw a rollover, hit it, and owwww. It rolled back up just where you couldn't see it on the way down. My poor right knee took most of the shock and I just lay there stunned for awhile, hoping walking wouldn't be out of the question when I found the will to stand back up. It took me a bit, but once I got going everything seemed fine, and I even hiked up a hill later on through someone else's footprints no problem. 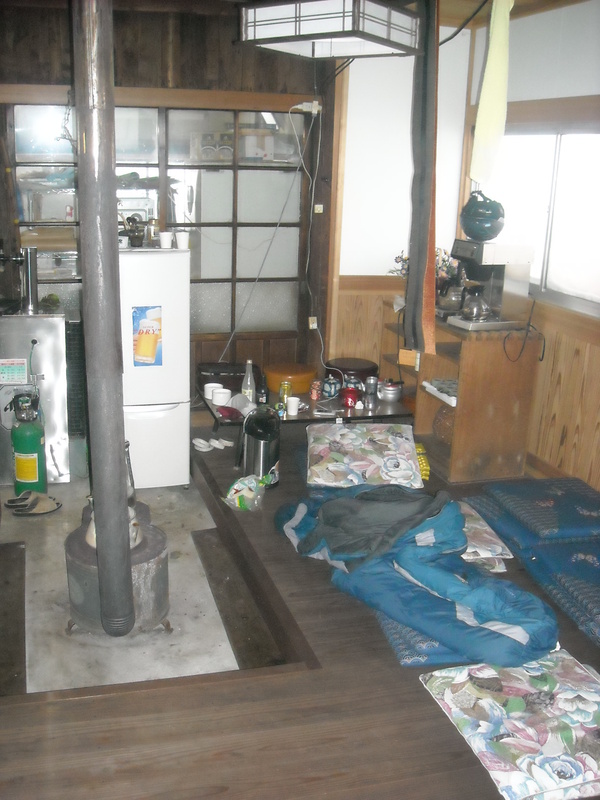 We made it out and back to our cabin in the mountain and the warmth its stove promised. Of course, the stove wasn't all that got us warmed up! That sounds dirty. Don't take it dirty. That's how Kazumi described it. We were having our new years feast all over again. Hatano-san, who first appeared in this blog back at Hakkouda, showed up in the evening to join in on the festivities as well as the assured fun of the next day. The place we were staying was open in the summer as a fishery / fish specialty restaurant sort of thing. 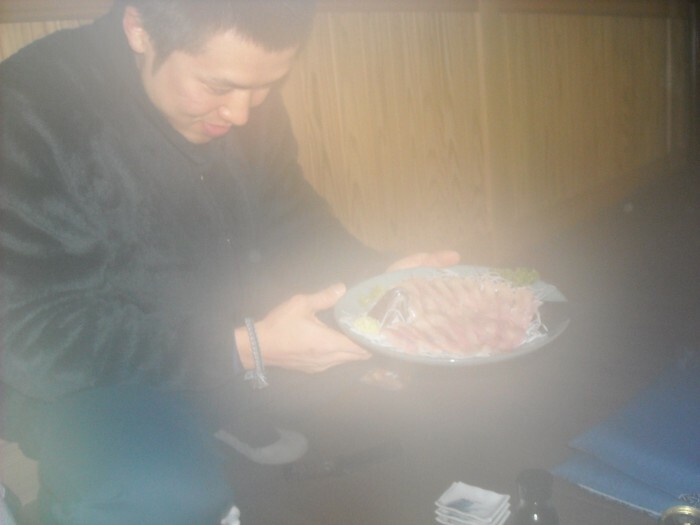 The people who ran the place happened to be home in a building a ways off and had made us some ridiculously good fish meals, including this sashimi obscured by the fog on my lense. 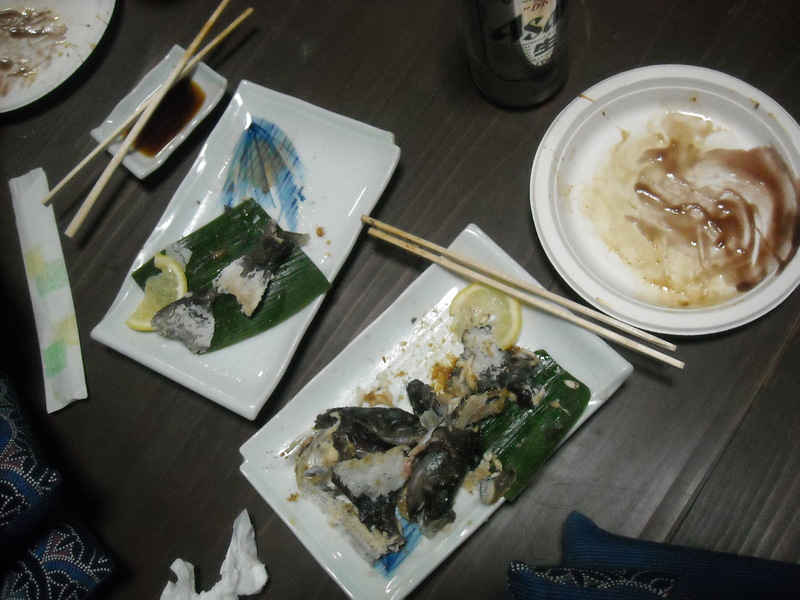 So, I was too busy devouring the fish to get a photo of it, but here's my plate and Jun's plate after the carnage. On my plate you can see the fishes head, spine, and tail sitting on the plate after being scattered in the search for the great white meat. On Jun's plate you can see... well... just the very, very end of the tail. I'll leave it to you what happened to the rest of his fish. 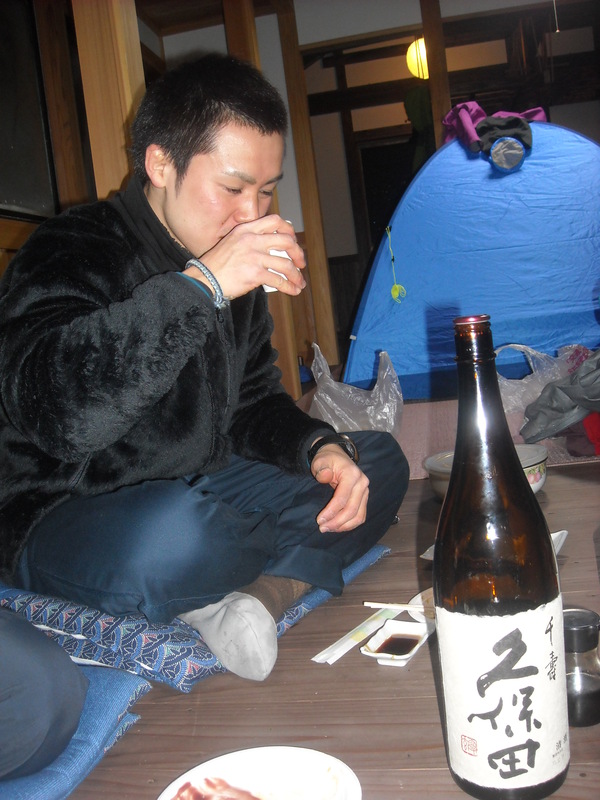 So here in Japan drinking is a bit of a ritual. Part of that is that the youngest member has to make sure that everyone always has something in their cup (Kanji was working hard) and also that you never pour for yourself. As the evening wore on, I noticed my right knee was getting stiffer and stiffer, sorer and sorer. I kept ice on it best as I could, but there's only so much that stuff can do. Being awoken in the night by the pain of my own movements made me dread the next day. By morning, walking was out of the question for me. I saw everyone on their way for a second day of skiing, then settled in to do what work I could, get some reading in, and ultimately nap by the bed I set up near the fire. 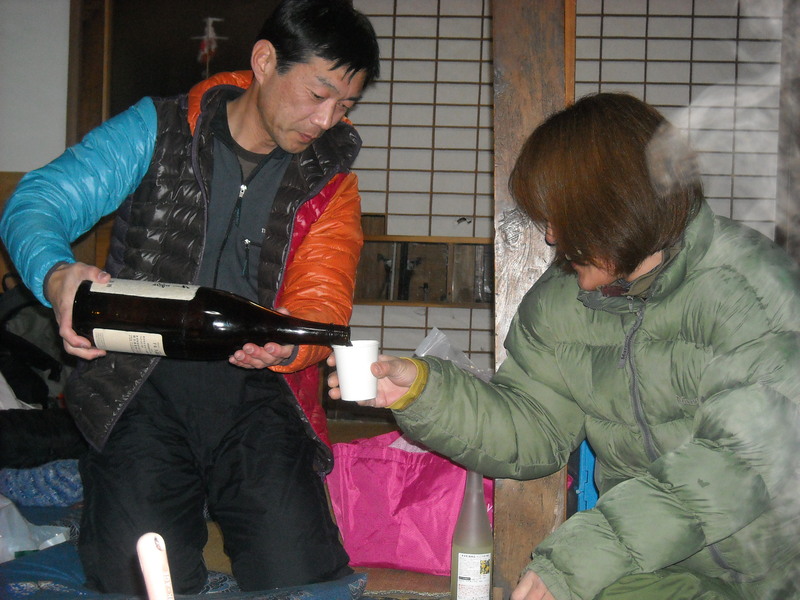 I kept some water warm on top of the stove and mixed it with some left over plum and yuzu sake, made oyu wari (hot water mixed with whatever) drinks for myself, and ended up sleeping straight through til everyone got back for a group photo. Even with the injury, the weekend was a great success. Lucky for me, Jun is a physical doctor fella guy, so I made it over to his place on Monday and got some work done on my leg. Missing out on skiing actually felt terrific, I think I needed the rest. On top of that, it had been dumping snow since we had quit the night before, and there was ultimately too much of it for anyone to actually be able to slide down a mountain. 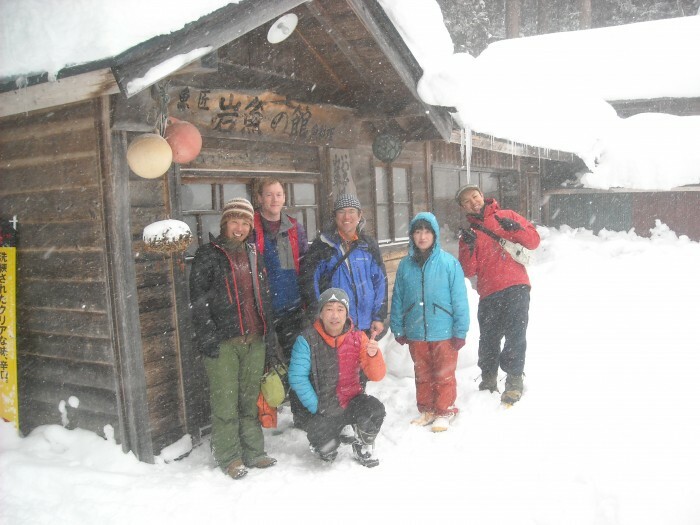 So, that was my last backcountry adventure in Japan. 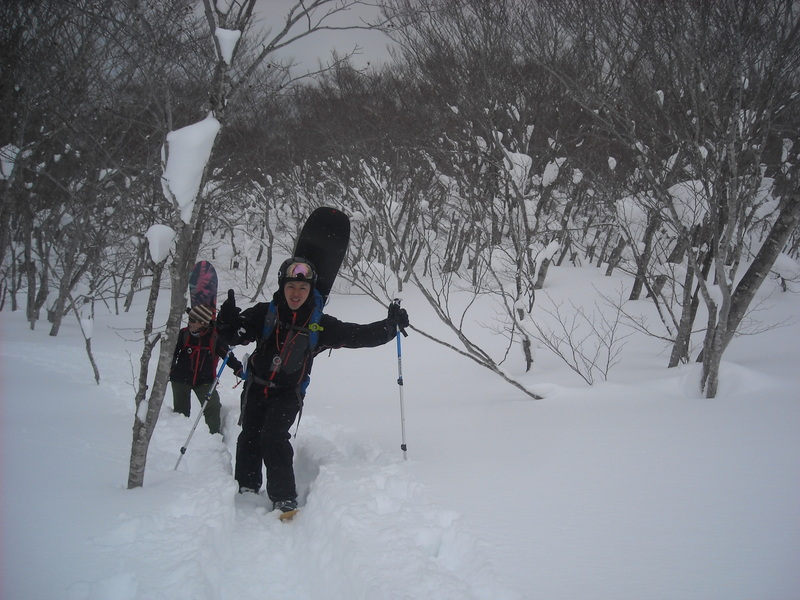 I'm taking this next weekend off, I'll be in Tokyo the weekend after that, and then the weekend after that will be a few days snowboarding inbounds at the legendary Niseko up in Hokkaido. That will then be the end of my snowplay in Japan as I'm shipping off my boards. 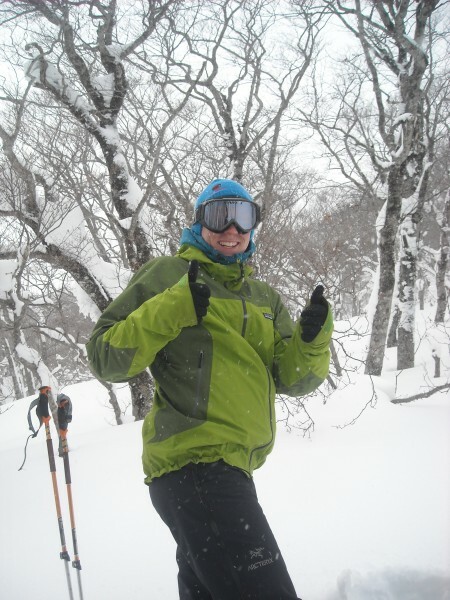 That seems like it ought to be sad, but the end of snowboarding is the start of climbing! I'm very much looking forward to that.